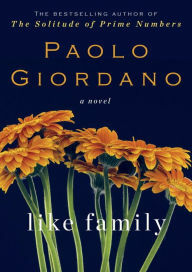 If Paolo Giordano actually means his characters are Like Family, it's a sad little family in his latest novel. It's a novel that leaves readers with more questions than answers. The unnamed narrator and his wife, Nora, have been married ten years. For most of those years, Mrs. A has been with them. She came as a companion when Nora was bedridden with her pregnancy, and then stayed as on as nanny for their son, Emanuele. The family grew dependent on Mrs. A for everything. In fact, who knows if the family would still be together without her glue. And, then Mrs. A left them abruptly, saying she was tired. That tired condition was terminal cancer. As the narrator tells of Mrs. A's final year, he also reveals how the family revolved around her. While the narrator, a physicist, looked at jobs away from Italy, Nora and Mrs. A plotted to stay in Italy, at home. Mrs. A was the one to see Emanuele's first step. She was the one to pamper the narrator himself while Nora was out of town. As much as the family depended on her, they didn't know how to cope with her cancer, or, how to cope without her in the house. Perhaps this novel was more appealing in the original Italian. Perhaps I really don't appreciate literary novels. But, I found this a sad book, a sad family. And, everything the narrator said revealed them as selfish, concerned only with their own lives, and not with the woman who had cared for them for eight years. Yes, he took her to get a wig. Yes, Nora visited. But, when they visited as a family, they eyed paintings and furniture, questioning Mrs. A as to who would get it. Like Family revealed a self-centered family. Who knows if they'll manage to stay together after Mrs. A? Who cares? They really don't come across "like family". Like Family by Paolo Giordano. English translation by Anne Milano Appel. Viking. 2015. ISBN 9780525428763 (hardcover), 146p.